I first got involved in track in grade 6, representing my school at districts, regionals, and provincials, however I started taking it seriously when, in grade 8, I got recruited to train with my long-time coach, Jake Borden. In the past you've described your sister Denver, who also competes in the long and triple jump events, as your biggest competitor. Tell us about the competitive relationship between you and your sister. What do you enjoy most about this sisterly rivalry? My sister and I have always been very competitive with one another and we always push each other during every workout. If she was running fast, I'd want to run faster. If she jumped far, I'd try to jump farther. I think that constant competition with each other, along with each other's support to see each other succeed, got us to be the athletes we are today. What I enjoy the most about the sisterly rivalry is that we push each other to be the best we can be. You come from a predominantly multi-sport background, having at some point played nearly every sport offered in Nova Scotia, including hockey, soccer, and basketball in addition to athletics. How has your multi-sport background helped you become a better jumper? Being a multi-sport athlete my entire life made me a well-rounded athlete and gave be the ability to grasp the concept and techniques of jumping very quickly, along with the strength and speed it takes to excel in long and triple jump. Playing multiple sports helped make me more explosive and powerful, which is important in jumping. After playing so many sports, you learn what mindset it takes for you to perform your best and that helped me a lot when it came to competing. Track is a mental sport and you need to have the right mindset in order to achieve your goals, which I learned through participating in many other sports. That helped me become a better jumper overall. 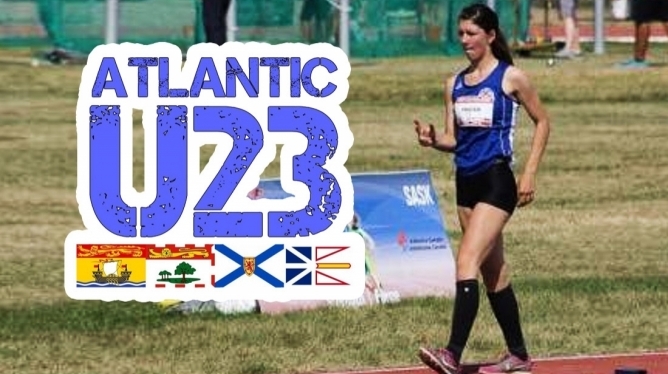 During your years competing for Team Nova Scotia/Nunavutat the Canadian Legion Track & Field Championships, you won two bronze medals in the triple jump, one in 2015 and the other in 2017. Take us through your years in the Legion program. What were some of the ups and downs? The Legion Nationals were a great experience. Every year, it was an event I looked forward to because I got to compete against the best in the country. Achieving a bronze medal in Sainte-Thérèse, Quebec in 2015 with a personal best in the triple jump was a moment I'll never forget. Every year after that, the work I put in all season was so I could perform my best at these Championships and show the country what I was capable of. I'm very thankful for the Royal Canadian Legion, for giving me and many other young athletes the chance to compete at the highest level possible. Throughout my three years representing team Nova Scotia/Nunavut, I formed many friendships with members of the team, and athletes from across the country. Competing my last year in Brandon, Manitoba was a highlight of my legion experience: I wanted to finish off Legions in a good way so I went out and won bronze with a personal best. Being able to compete in this championship and represent Team NS/NU with my sister for three years was something I'll never forget. The Canada Summer Games was something my sister and I always wanted to compete at. Since it only comes around every four years, not many people get the chance to compete there. We set the goal at the beginning of the season to represent the province at the Summer Games, and it felt really good when we won our events at the Trials and all the hard work paid off. I couldn't imagine going to Canada Games without my sister. It made me feel very proud and excited to be able to qualify for the Games together, considering having to compete against people aged under-23 for the two spots available in the each event. At the 2017 Canada Games, you finished 8thin the triple jump with a near-personal best attempt of 11.52m in the finals. Take us through your Canada Games experience. Were you happy with your performance? Competing at the 2017 Canada Games was a feeling I'll never forget. I had so much adrenaline and excitement going into the qualification round; I knew I would be competing against girls who were a lot older than me, however I felt ready. In the qualifying round I jumped 11.98m, which was a wind-aided personal best that made me go automatically to the final. Going into the final I was ranked 2nd overall. I was happy with my results for the final and however, I faulted a few big jumps that I wish could have counted. At nineteen years of age this year, you are still eligible for the next Canada Games in 2021, taking place in the Niagara Region of Ontario. Having competed in an edition of the Games already, what goals do you have in mind for the next edition? In 2021, I will be able to go into the Games being more confident and have four more years of training and experience that will help me be able to jump far enough to place top three. After graduating high school in 2018, you enrolled at the University of Nevada and began competing for the Wolf Pack track and field team. What made you choose Nevada over other universities? I chose Nevada because I've always dreamt of competing for a Division I school in the NCAA and I wanted to be able to compete outdoors. I also really liked the campus, the program, and the coaches. Studying kinesiology and competing for the university's track and field team can make for a busy schedule. Take us through a typical day in the life of training as a member of the Wolf Pack? I start off the day with early morning class and then go get breakfast, then to the athletes academic center for two hours and do all my assignments. We then have practice and weights and then class again in the afternoon. What have been some of the advantages of training and competing at an NCAA Division I school, opposed to a Canadian school in the U SPORTS league? Some of the advantages of competing in the NCAA Division I is that we get to have both an indoor and outdoor season. Also the caliber of competition is often higher so you get pushed more. Due to your participation in multiple sports, you've only competed indoors a couple of times in your career. How has this been an adjustment now that you're training and competing indoors in the NCAA? I've only competed indoors once so training and competing indoors is a little different but I am adjusting well. Not having to take weather and wind into account has been different, along with the spacing of the jumping pits and runways. The more meets I have indoors the more comfortable I'll feel indoors. What are your goals for this indoor season? My goals for this indoor season is to get faster on the runway and to jump 12.50m. I hope to make the all-time top-ten list for University of Nevada (1st, 12.65m - 10th, 11.46m). Still months away, but how about goals for the outdoor season? I hope to improve on my performance from indoor season, become stronger, and improve my technique. My other hobbies include being outdoors and playing other sports like hockey.